GAINESVILLE – When she was accepted to the University of Florida, there was never a doubt in Shannon Moore’s mind where she would spend the bulk of her time on campus. A third-generation member of the Gator Wesley Foundation, she shares a legacy of leadership, faith and service with her parents and grandparents. 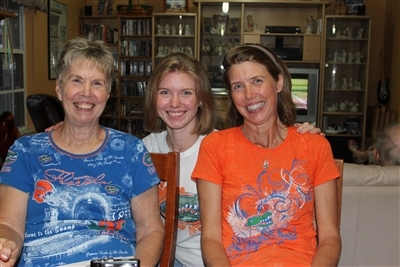 Gator Wesley student Shannon Moore is flanked by her grandmother, Pat Nelms, left, and her mother, Sandy Moore. Shannon is the family's third generation to participate in the student ministry at the University of Florida. Photo from Shannon Moore. “I’d heard about Gator Wesley all my life and knew I wanted to be a member,” said Shannon, now a junior at UF. She remembered enrolling as a freshman for the summer term and promptly heading to the foundation’s center on University Avenue upon arriving in Gainesville. But there was no big welcome awaiting her. The building was deserted. “I’d been so excited to get there, I didn’t realize the center wasn’t open yet,” she said. She didn’t have to wait long to experience the Gator Wesley hospitality she’d heard so much about, though. The next day the center filled with people. Shannon said she knew that day that her campus social life was established. Today, Gator Wesley has an average participation of 150 students in Sunday worship, Bible studies, intramural sports, tailgate parties and mission work, reported Rev. Narcie Jeter, the ministry’s executive director. About half are lifelong Methodists, she said, while others come from other faiths or profess no religion. Whatever their background, they can find grace and support at Gator Wesley. "I read an article saying students are desperate for community,” Jeter said. “They don’t know they are, but it’s the thing that will help them survive college. The community picks you up and ministers to you when you’re journeying through hard places." Today, Shannon resides at the center as a member of the Upper Room Staff and leadership team. Following in the footsteps of her parents, Sandy and David Moore of Fort Myers, Shannon is a member of Gator Wesley’s Marantha Student Choir. She also plays piano in the praise band and is a student representative on the Gator Wesley Foundation board, of which her grandparents, Pat and Warren Nelms of Gainesville, are members. 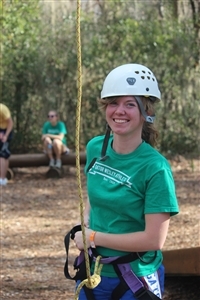 Shannon Moore prepares to hit the ropes course on a Gator Wesley Foundation retreat. Photo from Shannon Moore. More than 50 years after first stepping into the Gator Wesley Center, the Nelmses continue to play an active role in the foundation they joined in 1956. When their daughter, Sandy, was accepted to UF in 1980, they encouraged her to join the student ministry they had found so rewarding. Through Sandy’s service as Marantha pianist, she met her future husband, choir member David Moore. He fondly recalls gathering with friends at Wednesday night dinners where they’d share a home-cooked meal for $1.50. Twice a year, the Marantha Student Choir would tour the state, performing concerts and sharing meals with host families. His daughter has found similar performance and fellowship opportunities through music. “It’s nice to follow in my parents’ footsteps and tour the state, spreading the story of Christ through our music,” Shannon said. In addition, she serves on the chapter’s communications team and in its mission project at L’Arche Harbor House, a community for intellectually disabled adults in Jacksonville. -- D'Ann Lawrence White is a freelance writer in the Tampa area.